Pine Gables is now a Certified Wildlife Habitat with the National Wildlife Federation! Pine Gables now has free WiFi for all our cabins!! Three Night Delight: Now till May 15, Arrive on Monday or Tuesday and spend three nights in any new cabin for only $345! * Five Cabins are Pet Friendly! * Pine Gables Historic District is listed on the National Historic Registry. Pine Gables Log Cabins are located in the Town of Lake Lure and only one mile south of the charming mountain Village of Chimney Rock, NC. Pine Gables offers canoes, horse shoes, private fishing ponds, and a dock on beautiful Lake Lure. All set in a natural landscape with diverse flora and fauna. Plus, only a short distance away you will find the Lake Lure Beach and Marina, Historic Lake Lure Inn, Restaurants, Chimney Rock State Park, Lake Lure Tour Boats, horseback riding, rock climbing, whitewater rafting, tennis courts, Chimney Rock Village and fly fishing on the Rocky Broad River! Also in Lake Lure you will find two championship golf courses and a municipal nine-hole golf course. In less than an hour from Pine Gables Cabins you can drive to the historic towns of Rutherfordton, Brevard, Columbus, Tryon, Saluda, Hendersonville, Asheville and the Biltmore House. Its also a short drive to the Pisgah National Forest and the Blue Ridge Parkway. While at Pine Gables Cabins don't forget about Dupont State Park, the Cradle of Forestry and a multitude of other outdoor adventures Western North Carolina is famous for. Jim's Cabin, Tootsie's Cabin, Owl's Nest, Ceilidh Cabins, Fishing Cabin, Raven's Roost and Wandering Bear are pet friendly for a mountain vacation with your furry friend. At Pine Gables Log Cabins, we invite you to escape to the beauty of the Western North Carolina Mountains. Our Western North Carolina cabin rentals are fully stocked for your vacation. Our new log cabins also feature a hot tub on a screened porch, fireplace, full kitchen, dishwasher, gas grill and washer & dryer. We now have free WiFi at all our cabins. Pine Gables Log Cabins offer the best Lake Lure has to offer. Lake and mountain views mixed with wooded seclusion on 9 acres that feature huge hemlocks, white pine, holly, cedar, maple, oaks, and an open meadow. A gourmet dinner at one of the restaurants in Lake Lure is just around the corner, or you can settle into a relaxing evening on your porch and enjoy your grill and private hot tub at your romantic cabin. The cultural attractions of Asheville, Hendersonville and Brevard are a wonderful day-trip destinations, as is the scenic beauty of The Blue Ridge Parkway and Chimney Rock Park. We are in the process of becoming as energy efficient and eco-friendly as possible. We are adding insulation and replacing old appliances with Energy Star rates fixtures (as we can afford them). Of course our new front load washer/dryers, heat pump (21 SEER), dishwashers and televisions are all Energy Star rated. We are replacing our bed linen with luxurious certified organic sheets. We use natural cleaners and hypoallergenic laundry soap. When possible we have purchased locally made furniture (Robin made the mosaic tile porch tables). We're not totally green yet, but we are headed in that direction! Our new log cabins are for couples, but families are always welcomed at our Historic one and two bedroom log cabins. We look forward to having you as our guest at Pine Gables Log Cabins, family & honeymoon cabins (with hot tubs) near Chimney Rock, Asheville and The Biltmore House! 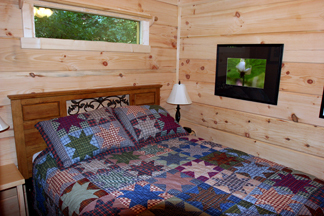 Our cabins are built by Green River Cabins. These are great folks to work with. (c) Copyright 1997 to 2019 by Jim Proctor. All Rights Reserved. No portion of this site, including this home page and any of the separate pages, may be copied, retransmitted, reposted, duplicated or otherwise used without the express written permission of the copyright owner.